Initial installation requires one-time internet connection for Steam authentication; software installations required (included with the game) include DirectX and Visual C++ Redistributable 2012. © 2005-2018 Take-Two Interactive Software, Inc. and its subsidiaries. 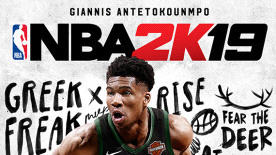 2K, the 2K logo, and Take-Two Interactive Software are all trademarks and/or registered trademarks of Take-Two Interactive Software, Inc. The NBA and NBA member team identifications are the intellectual property of NBA Properties, Inc. and the respective NBA member teams. © 2018 NBA Properties, Inc. Officially licensed product of the National Basketball Players Association. All other trademarks are property of their respective owners. All rights reserved.